People smoke or chew tobacco for all sorts of reasons. Maybe you started when you were young because of peer pressure, or perhaps you use cigarettes to cope with stress. However, you know that using tobacco is one of the worst possible things you can do to your body. Every part of you — including your mouth — suffers. But exactly how does tobacco affect your oral health? Your dentist in Marysville is here to explain some of the possible consequences that this vice can have on your teeth and gums. Smoking and chewing tobacco can both greatly increase the likelihood of developing gum disease. It begins in a mild form as gingivitis, but if it’s left untreated, it can escalate to a much more severe condition known as periodontitis. You may suffer from receding gums, painful infections, and even tooth loss. It’s also worth noting that the bacteria that sneaks into your bloodstream because of gum disease can lead to problems throughout your body; it may contribute to the development of dementia and cardiovascular disease. Any form of tobacco can increase plaque and tartar buildup on your teeth, leading to cavities. If the problem becomes severe enough, you could lose teeth. Alternatively, you may need root canal therapy to save your teeth from extraction, but tobacco use makes it more difficult to heal after dental work. Oral cancer can attack anyone, but people who smoke or chew tobacco are at a much greater risk of developing this condition. In fact, 90 percent of people with cancer of the mouth, lips, tongue, and throat use tobacco. You may put a lot of thought into the outfits you wear each day and the way you groom yourself, but an unattractive smile can seriously detract from your appearance. Tobacco can stain those pearly whites of yours, turning them into yellow, brown, or even black blocks of minerals. You can use whitening products to combat some of the discoloration, but you’ll be fighting a losing battle. Another concern is the bad breath that tobacco can cause. No one wants to be the person who is known for the odor that comes out of their mouth rather than their willing personality. If you use tobacco, one of the best things you can do for your oral health is quit. You may be amazed by how quickly you notice positive changes in your smile! However, whether you quit or not, it’s extremely important that you visit your dentist regularly. A dental professional can fill cavities, look for signs of oral cancer, treat gum disease, and brighten your smile with powerful whitening techniques. Together, you and your dentist can get your oral health back on track. The team of friendly dentists at Darby Creek Dental is eager to help folks in Marysville have excellent oral health. 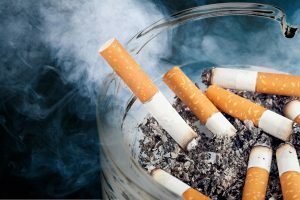 If you’re concerned about the damage that tobacco has done to your teeth and gums, contact our office at 937-644-8822.